Emergency service workers responded to the derailment of a Brooklyn-bound F train just south of the 65th Street station in Woodside, Queens. Photo: Metropolitan Transportation Authority / Patrick Cashin. The Metropolitan Transportation Authority (MTA) is investigating the derailment of a southbound F train on the express track south of the 65 St R M station on the Queens Boulevard line. The derailment occurred at 10:24 a.m. on Friday, May 2, when six cars of an eight-car Brooklyn-bound F train went off the track. The wheels of the first and last cars remained on the track. 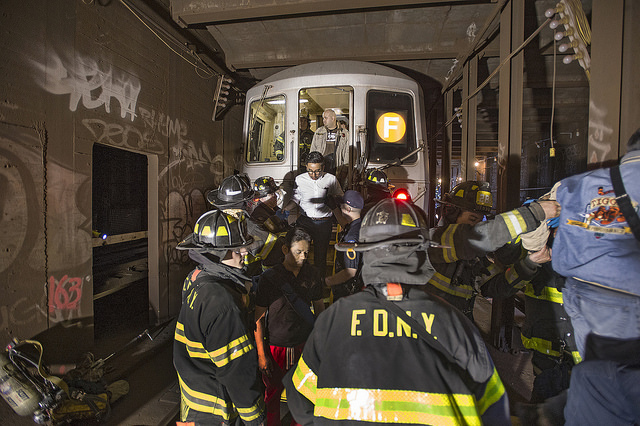 New York City Fire Department and Police Department personnel helped to evacuate approximately 1,000 customers on the affected train through an emergency exit in about two hours. An E train in the area was moved back to Queens Plaza where passengers were discharged with no injuries reported. MTA Chairman and CEO Thomas F. Prendergast said the MTA will conduct a thorough investigation of the circumstances of the derailment, including full inspections of signals, track and all other infrastructure in the area. MTA New York City Transit crews are working to restore local service on the E F lines through Queens by the Friday evening rush hour. Express service in both directions on the Queens Boulevard lines will be suspended until after the incident train is removed from the tracks after the rush hour. The M R trains will not run along the Queens Boulevard line. R trains will run between Whitehall St and 57 St-7 Av in Manhattan. M trains will run between Metropolitan Av in Queens and Chambers St in Manhattan. Limited shuttle bus service has been established between Forest Hills-71 Av and Queens Plaza and between Forest Hills-71 Av and 21 St-Queensbridge. The 7 train will provide some alternate service for Queens Boulevard line customers as well. MTA Long Island Rail Road is cross-honoring valid MetroCards between Penn Station and Jamaica Station. This service plan will be in effect until the derailed train can be removed and all necessary inspections and repairs can be completed. There is no timetable for restoration of express service. Local E F service may be temporarily suspended to accommodate this work. Scheduled weekend work on the 7 and J lines has been cancelled to accommodate customers using those alternate routes. I will either post or tweet any new info as I receive it so make sure to follow me (@TransitBlogger) on Twitter.